Finally, after a whole year of horrible ice (Kandersteg, Iceland...) we wanted to climb something proper. We heard Cogne in Italy was the only place this year that had some ice. All other areas were far too dry or warm. So, we skip the comp in Rabenstein (which would be too far anyway) and just climb ice for 1,5 weeks. The first day we had a proper warm-up in a-route-of-which-I-forgot-the-name-already. 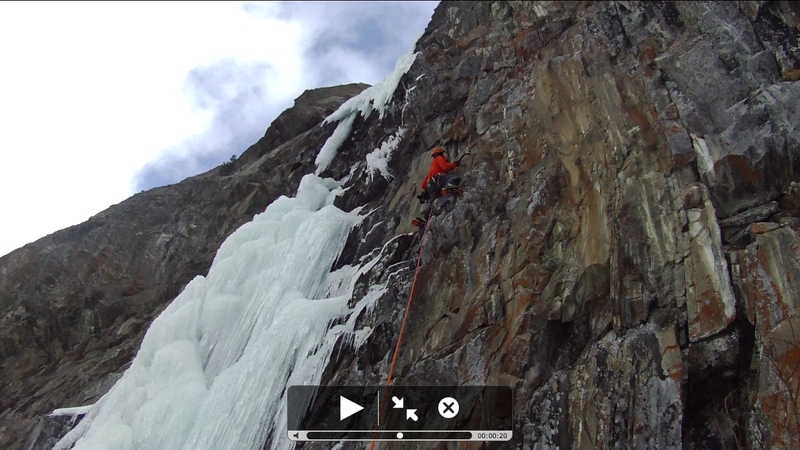 The ice was thin at some places but very nice to climb. Mixed in the middle, totally dry top-out and proper ice in the start. After a paper-scissor-stone game I was the one to start, I had all the proper ice pitches and the dry top-out, Dennis had one ice pitch and the snow in the middle. Lucky me :) Though, Dennis was the lucky one to climb the mixed pitch in the middle. Thinking back I still feel sick of it. After that we climbed the first pitch of 'Hard Ice' figuring the second M10 pitch looked too weird, scary, loose and some ice was missing... So we bailed again (not motivated to try the A2 option on the right) The first pitch was quite a thing, harder then it looks. The stalactite had almost formed a pillar. I recon it takes just a couple more days of good frost and then it will stand. I am Marianne, fanatic in everything that has to do with thinking and movement. My passion, style of living, sports, ´thing´ is climbing, iceclimbing, sportsclimbing and bouldering.